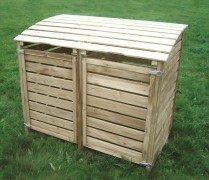 Wooden Bin Stores - Hillsborough Fencing Ltd. Outdoor bins are a great item to have in your garden, yet can often be quite an eyesore. Fear no more! We’ve brought you double bin covers that will be the envy of all of your green-fingered friends! Combining efficiency, effectiveness and elegance, our double bin covers are designed to look nice, successfully doing what they’re designed to do.